This recipe for seafood lasagna produces a gorgeous, super rich and savory meal. Serve with garlic bread and a salad. PREHEAT oven to 350 degrees and lightly spray a 9x13 dish with vegetable oil. Bring a large pot of salted water with 1 tablespoon of oil added to a boil and cook the lasagna noodles until al dente. Drain well and set aside. Heat the canola oil in a large saucepan over medium and saute the garlic and mushrooms until tender. Add the homemade Alfredo sauce and whipping cream; mix well. Now add the seafood and simmer on low for 10 minutes. Meanwhile, in a small bowl, whisk the ricotta cheese with the beaten egg. 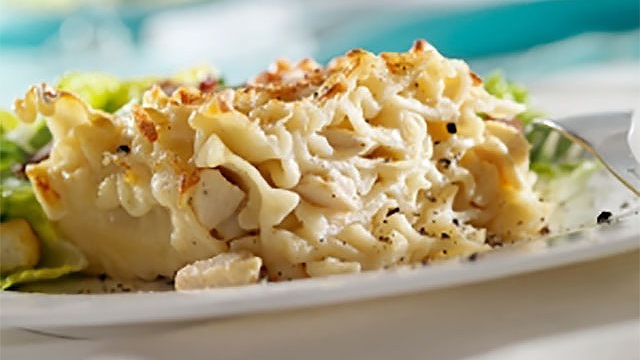 In the prepared baking dish, layer the lasagna as follows: lasagna noodles, ricotta cheese mixture, seafood mixture and top with some of the shredded cheese. Repeat layers until all of the ingredients are used. Save half of the shredded cheese for the topping. Cover with foil and bake another 15-20 minutes. Serve with garlic bread and a fresh salad. My secret to this rich and velvety sauce is the cream cheese. Melt butter in a heavy skillet on low and add the cream cheese and minced garlic; whisking while it is melting. Add the half-and-half and milk 1/2 cup at a time and whisk well after each addition. Stir in the Parmesan and Romano cheese. When sauce thickens, take off the heat immediately. If it is too thick for your taste, just add a little more milk until you reach the desired consistency.